‘The early bird catches the worm,’ Georg Wilhelm Heinrich Erdmann Freiherr von Pölnitz no doubt thought to himself as he enrolled at the University on 24 March 1742. The peculiar thing about this was that the University had not yet been founded at that time. This apparent contradiction can be explained by the fact that Friedrich-Alexander-Universität Erlangen-Nürnberg as we know it today was first established in Bayreuth in 1742 as Academia Fridericiana, and was only relocated to Erlangen and awarded university status the following year. 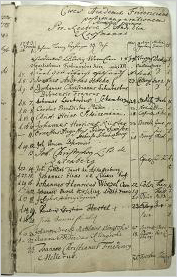 The enrolment records therefore start with the first student who enrolled in Bayreuth. The first student to enrol in Erlangen following the inauguration of the University was Johann Lorenz Arzberger from Ipsheim. He enrolled on 6 November 1743 to study law. And the first female student? It is hard to believe but until 1903 women were not permitted to study at universities in Germany. In comparison with other countries, Germany was somewhat behind the times. The first female student was Fanny Fuchs from Nuremberg, who enrolled to study medicine in Erlangen on 21 November 1903. The first full-time female student, Emmy Noether, completed her doctoral degree in 1908 and later achieved worldwide fame in the field of mathematics. In 1950, Gisela Freund, a student of prehistory and early history, became the first woman at Friedrich-Alexander-Universität Erlangen-Nürnberg to complete her habilitation. The University appointed Ingeborg Esenwein-Rothe as the first female professor at the Chair of Statistics in 1963.